Can you believe it’s already December? 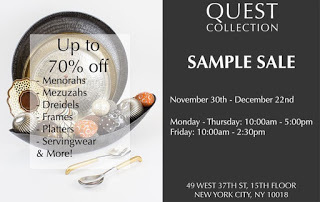 The holidays are upon us and if you are still in search of gifts then this month’s sample sales are here to help. Quest Collection‘s decor pieces make great gifts for friends and co-workers while Korres beauty products are the perfect stocking stuffers. 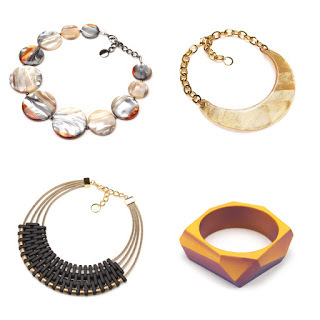 Pick up some sparkly jewelry for the ladies in your life at Pono by Joan Goodman or Buccellati sample sales. Treat your man to a luxury Swiss watch at the Frederique Constant sale or spoil them with a new wardrobe at Theory, Hugo Boss, and Thomas Pink. For the ultimate gift of luxury there is the vintage Chanel sample sale as well as multi-brand sales at Soiffer Haskin and JennX. Any sale you’re excited to shop? Know something that’s not listed here? Share in the comments and remember to follow me on my social media channels for all the latest news. Happy shopping! UPDATE: 12/2 Extra 40% off. 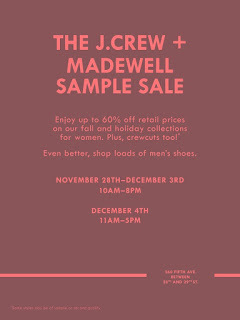 J.Crew and sister brand Madewell are back together for their always popular winter sample sale. Expect to save up to 60% off retail on women’s apparel, shoes, and accessories. The sale also offers a small selection of men’s footwear. 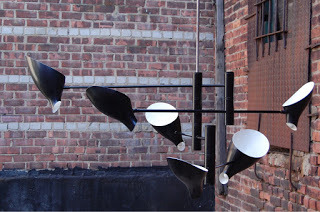 Please read my report from last year’s sale for more details. UPDATE: Extra markdowns on Steven Alan merchandise. Save up to 75% off retail at Steven Alan winter sample sale. Expect to find men’s and women’s apparel and accessories by Steven Alan as well as major designer brands like 3.1 Phillip Lim and much more. 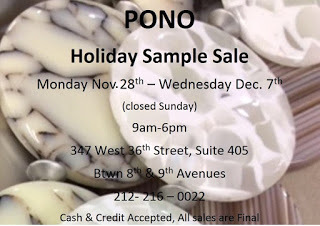 Save 50% to 80% off retail at the semi-annual Pono by Joan Goodman sample sale. Meet the designer herself while checking out a great selection of statement jewelry pieces like the signature Sunstone Angle Bracelet $30 (retail $60), Many Moons Resin Necklace $180 (retail $440), Crescent Moon Resin Choker $75 (retail $215), and Egyptian inspired Sophia Resin Choker $200 (retail $385). Stop by the bangle bar where you can get 10 pieces for just $50 (retail $250). The Quest Collection warehouse sale is back with savings of up to 70% off their signature home goods and decor. Find holiday gifts as well as photo frames, platters, servingwear, candlesticks, table decor, dreidels, mezuzahs, menorahs, and much more. UPDATE: 12/4 Extra 20% off. 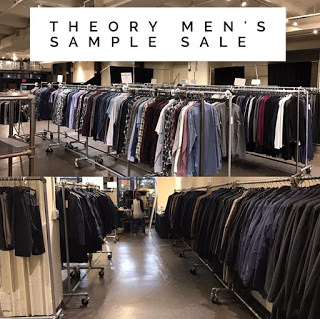 Save up to 60% off men’s clothing and accessories during Theory’s winter sample sale. 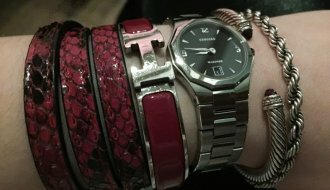 The brand hosted a women’s sale last month and you can check out my review to get an idea of what to expect since pricing is fairly similar. Expect additional 20% off during the weekend. 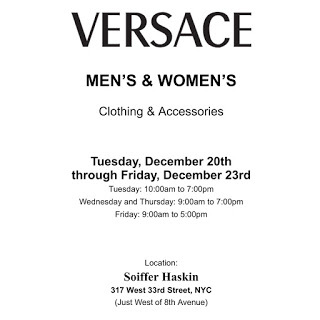 Soiffer Haskin 317 West 33rd St.
Save up to 75% off retail on men’s tailored clothing, sportswear, shoes, and accessories from Hugo Boss and Boss by Hugo Boss. The sale will also feature a small selection of women’s items. Expect additional discount as the sale progresses but prices are unlikely to compare with sales held inside the brand’s own showroom. 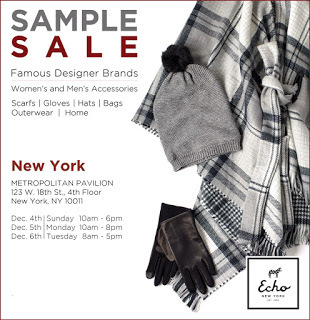 Save big on knitwear and cashmere accessories during Echo’s annual sample sale. Expect to find women’s and men’s scarves, gloves, hats, bags, outerwear, and home accessories. Save on luxury exotic handbags at the semi-annual Nancy Gonzalez sample sale hosted by Shelly and Renee. 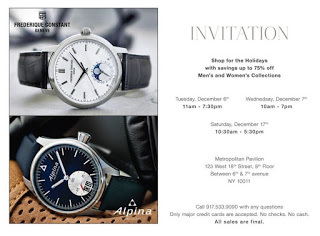 Save up to 75% off men’s and women’s designer Swiss watches at the annual Frederique Constant and Alpina sample sale. 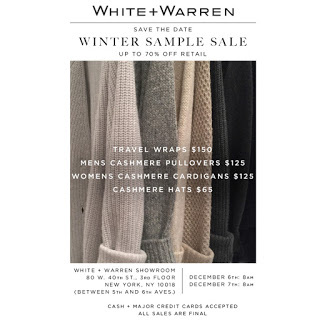 White + Warren two day sample sale is back this month with savings on the brand’s signature knit and cashmere apparel.Save up to 70% off stock pieces but dont forget to check the sample room that usually features boxes full of $35 cotton and $55 cashmere samples. Please see the pricelist from last month’s sale here. 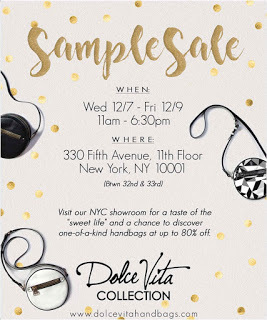 One of my favorite sample sale returns! 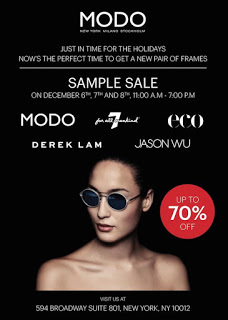 MODO winter sale will offer savings of 70% off retail on optical frames and sunglasses. At previous sales all eyeware was priced at just $20 a pair! MODO manufactures frames for brands such as Derek Lam, Jason Wu, 7 For All Mankind, and most recently Ellen Degeneres. They also produce their own branded frames as well as environmentally conscious Eco label. Please read my numerous reports from their sales here and here. UPDATE: Extra 25-30% off. Read my review for photos and info. Its party season! 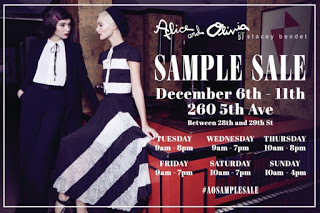 And who better to dress you than Alice and Olivia 🙂 Stacey Bendet’s label is back with their winter holiday sample sale offering great savings on women’s clothing and accessories. Don’t want to wait for official opening day? 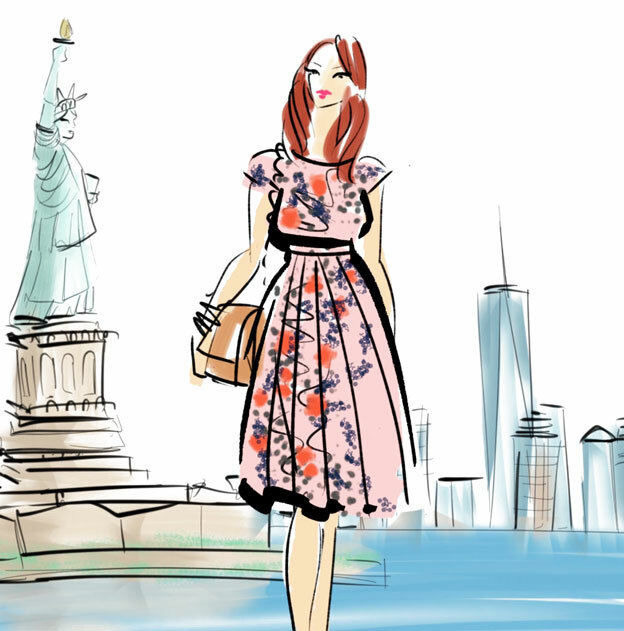 Then head over to Gilt and buy a ticket to the VIP preview on Monday. 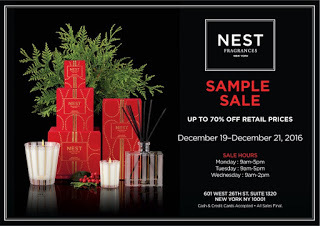 Remember this sale draws huge crowds and the ever-popular samples racks get decimated within hours of opening. 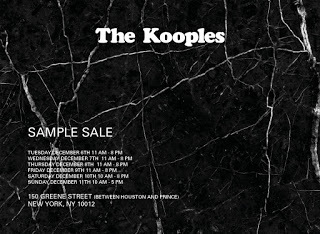 Add some Parisian chic to your wardrobe with semi-annual sample sale from The Kooples. Men and women will find savings of up to 80% off original prices on sleek apparel, footwear, and accessories. Please read my report from their last sale for more info. Save big on lingerie, loungewear, and sleepwear at Josie Natori winter sample sale. Save up to 80% off Dolce Vita handbags and accessories including true samples and overstock. Another great home decor sale just in time for the holidays. Prices will start at just $1 at Leila’s Linens sample sale. 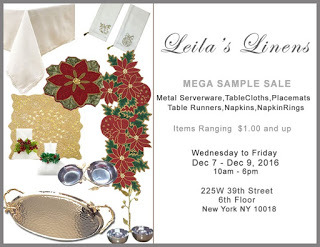 Expect to find metal serveware, table cloths, placemats, table runners, napkins, napkin rings, and more. 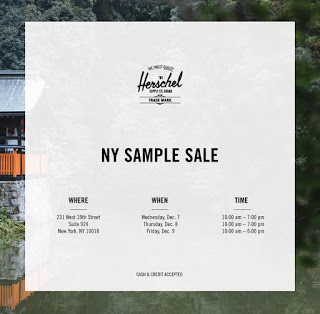 The insanely popular Herschel Supply sample sale returns with savings of 50%-75% off including their popular backpacks. Expect excruciatingly long lines (three hours +). This is only for the die-hards. Save up to 60% off retail at the Rag & Bone winter sample sale. The cult favorite label always attracts huge crowds despite somewhat modest discounts. Expect to find men’s and women’s shoes, accessories, and clothes. UPDATE: Read my review for info and photos. Save up to 75% off at the private Oscar de la Renta sample sale that will also feature select furs and accessories from Jocelyn, Reich, and Brandon Sun. Expect to find red carpet worthy gowns and RTW. Please contact [email protected] to make an appointment. You will be e-mailed the address with your confirmation. You can also read my report from Oscar de la Renta’s last public sale at 260 to see how the discounts and selection might compare. 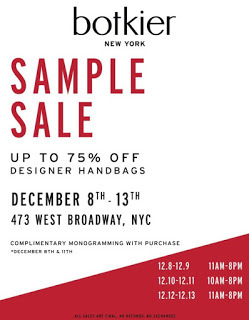 Save up to 75% off retail at Botkier sample sale. Shop Thursday and Sunday to receive complimentary monogramming with purchase. Better yet stop by Wednesday night for a special VIP reception that will include a raffle, minus celsius ice cream bar and first 30 people will receive a gift with purchase. 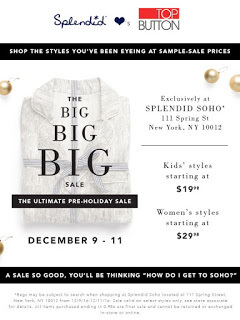 Splendid Boutique 111 Spring St.
Head over to Splendid’s SoHo store for their ultimate pre-holiday sample sale. Prices on wone’s styles start at just $29.98 while kid’s styles start at $19.98. 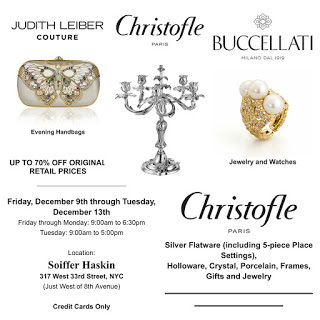 For those looking to splurge on holiday gifts head over to Soiffer haskin for their multi-brand sample sale featuring Judith Lieber evening bags, Christofle silverware, and Buccellati jewelry. Save up to 70% off silver flatware (including 5 piece place settings), holloware, crystal, porcelain, frames, gifts, and jewelry. Save on luxury Italian linens from Frette. Expect discounts of 70% off retail on bedding, including sheets, pillow cases, shams, coverlets, duvets, and more. 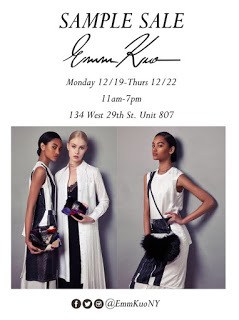 Snag some holiday stocking stuffers at Korres winter sample sale. 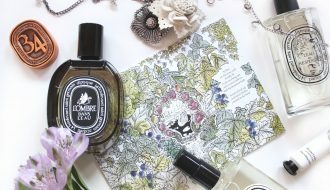 Greek beauty and skincare brand will once again offer savings of up to 80% off on their popular Rose and Yoghurt based products. Expect to find skincare, bodycare, shower gels, and color cosmetics. Please read my report from their last sale for more info. 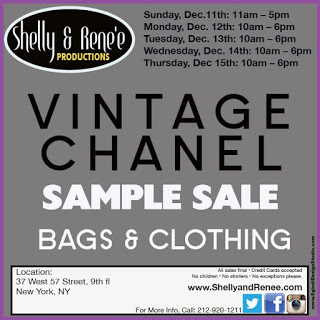 Shelly and Renee are bringing back the vintage Chanel sample sale just in time for the holidays. During previous sales I found Chanel handbags, clothing, jewelry, and footwear at prices comparable to consignment stores. The merchandise comes from Roundabout and is generally about 10% cheaper than their vintage store prices. You can read my report for more details. Save up to 70% off luxury Italian linens at Sferra’s winter sample sale. Expect to find bed linens, duvet covers, blankets, matelassé sets, throws, decorative pillows, towels, bath rugs, table linens, down, baby gifts, and more. 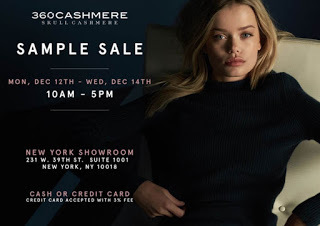 Stock up on cashmere and knitwear at the label’s winter sample sale. 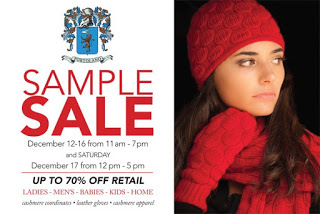 Portolano winter sample sale is back with savings of up to 70% off cashmere, knits, and other accessories. The sale also offers original samples with prices starting at $5. Please read my report from last year for more details. Save on men’s office essentials during Tomas Pink winter sample sale. There will also be a small selection of women’s apparel. UPDATE: Extra 70% off sale prices. 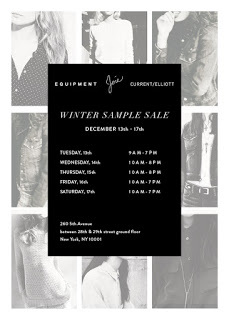 Save big at 260’s multi-brand sample sale featuring Equipment, Joie, and Current Elliott. Last year’s sale featured both stock and samples including a huge selection of denim but beware sample sizing is very limited. UPDATE: Extra 20% off (excluding suits). 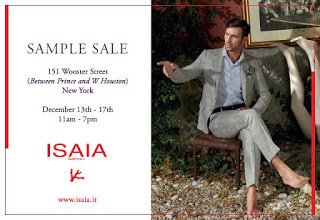 Save on Italian made menswear and suiting at the Isaia Napoli and Eidos sample sale. UPDATE: Extra 30% off, shoes $50 or 2 for $75. Read my review for details. Save on lingerie, sleepwear, lounge, and swimwear during La Perla winter sample sale. 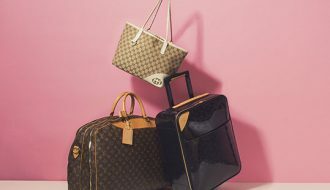 The last sale surprised shoppers with highly discounted samples at over 90% off retail now whether history will repeat itself is unknown but this sale is worth to keep on your radar. UPDATE: Now 80% off retail. Read my review for details. Join Le Sportsac for the return of their sample sale. It’s been almost seven years since their last sale so get ready to wade through the crowds as fellow shoppers try to load up on last minute holiday gifts. Save up to 70% off retail on tote bags, weekenders, wallets, backpacks, and much more. 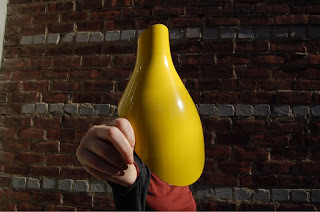 It’s winter and we all could use a new hat! 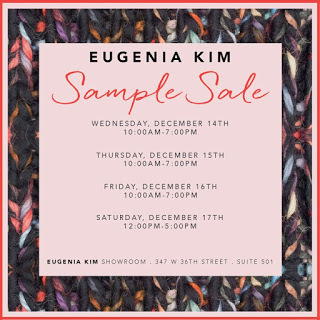 Head over to Eugenia Kim’s showroom for her semi-annual sample sale. In previous years your best bet was always the samples/damages bin as I found stock pricing much too high. Save up to 80% off winter essentials like fur hats, gloves, scarves, vests, and other apparel at Adrienne Landau’s winter sample sale. Guess what?! 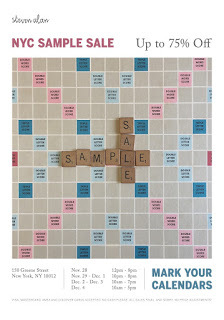 Best sample sale is back for another round but this time at the brand’s corporate offices at Starrett-Lehigh. Save up to 70% off candles, fragrances, room sprays, and skin care products. You can read all about their last sample sale at 260 here but I’m keeping my fingers crossed that this sale will offer much lower prices. Save up to 75% off retail on Fall/Winter ’16 handbags and accessories by Emm Kuo. 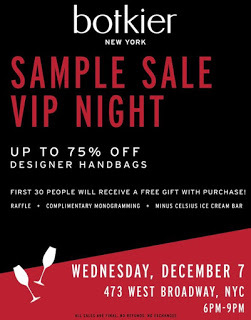 The sale will also feature a selection of their signature luxury evening bags and minaudières. Save on colorful apparel for the whole family at Desigual winter sample sale. 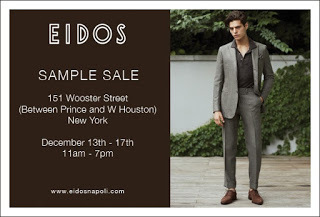 The Spanish label recently closed their midtown store with SoHo location also scheduled for closure so it will be interesting to see what effect this will have on the sample sale. 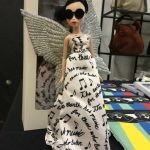 Hopefully Desigual will not be permanently leaving the US market. Luxury designer vintage retailer, WGACA is holding their annual sample sale with savings of up to 90% off retail. 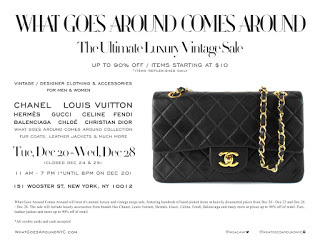 The sale will feature such high-end designers like Chanel, Hermes, Louis Vuitton, Gucci, Fendi, and many more. Expect to find handbags, accessories, jewelry, fur and shearling coats, as well as designer apparel. Prices will start at just $10 on vintage apparel and stock will be replenished daily. 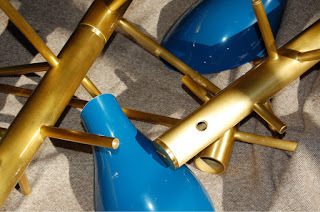 Read my review from last year to get a better idea of what to expect. UPDATE: Women’s accessories and shoes now 90% off, everything else 85% off. 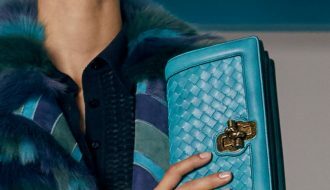 Treat yourself to a bit of luxury right before the holiday days with Versace winter sample sale. Expect to find apparel, accessories, and shoes for both women and men. While their last sale at Soiffer did offer discounts as high as 85% off retail it could not compare to the brand’s epic showroom sale two years ago.